Shoppers looking for their next hatchback will find a lot to love in the adorable 2015 Hyundai Veloster. In Carrollton, many drivers have already chosen the Veloster as their next car, as this charming hatchback offers terrific sport features, a fun driving feel and a comfortable interior that compact car shoppers will love. 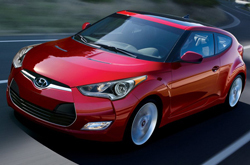 The 2015 Veloster comes in four trim levels: base, Turbo R-Spec, RE:FLEX Edition and Turbo. The base Veloster model offers tons of fun features, including 17-inch alloy wheels, dual centered chrome-tipped exhaust outlets, daytime running lights, a 6-speaker sound system, premium cloth upholstery, metallic interior accents and illuminated vanity mirrors. The next level Turbo R-Spec trim comes with unique 18-inch alloy wheels with chrome accent, a sport-tuned suspension, front foglights, projector headlights, rear LED taillights, unique interior upholstery, alloy pedals, R-Spec floor mats and an 8-speaker sound system. The RE:FLEX Edition adds leather upholstery, chrome hood accents, RE:FLEX Edition exterior badging, illuminated door sills, RE:FLEX branded floor mats and chrome exterior door handles. 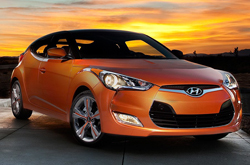 The top tier Turbo trim is our recommendation for those looking for a 2015 Hyundai Veloster in Carrollton. We loved the features on this trim, as they provided the best luxury and sport amenities that most Veloster drivers will want. Added features on the Turbo trim include a unique front fascia and grille, keyless ignition/entry, leather seats with lumbar support, heated front seats, a leather-wrapped steering wheel, black high-gloss interior accents and unique 18-inch alloy wheels with chrome accent. Our 2015 Hyundai Veloster review also loves the Turbo trim's terrific 201 horsepower twin-scroll turbocharged 1.6-liter four cylinder engine. Pair the engine with either the six-speed manual gearbox or the optional six-speed automatic transmission, and you'll find the Veloster is a swift and comfortable car that is amazingly fun to drive. Come by our showroom and test drive the 2015 Hyundai Veloster today. Our review highly recommends this charming hatchback to Texas drivers, who are looking for a fun drive, fantastic amenities and a lush, comfortable interior in their new car. When you compare Hyundai's new 2015 Veloster next to the 2015 Volkswagen Scirocco, Mini Cooper S, Volkswagen GTI, Mitsubishi Lancer Sportback and the Scion tC, we're sure you'll realize that the Veloster is perfectly designed for you. You'll be smitten with the Veloster's long list of terrific qualities, including its cut-rate cost and state-of-the-art cabin features. It's a fantastic value, which you'll clearly see when comparing its price to the vehicles in its segment. For more information, check out the Veloster's quick-facts list underneath this text. 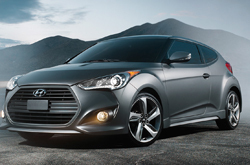 Now that you've read the 2015 Hyundai Veloster review above, please contact Van Hyundai for a test drive. With the help of skilled automotive writers, we have written some of the best reviews about Hyundai's models that you'll find online. 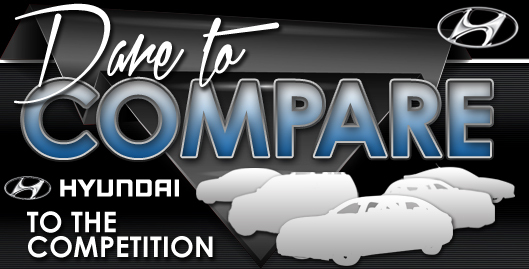 Everything perspective car buyers need to make intelligent decisions is right here, including info regarding powertrain options and other specs. Each section is filled with essential data and specs - all at your fingertips. After viewing our review of the Veloster, find out about financing offers that'll help you save a substantial amount on your purchase at our Hyundai dealership in Dallas.